Yet another Jewish inventor of a calculating machine (many inventors of Jewish origin are mentioned in this site, let's mention only Stern, Slonimski, Roth, Staffel and Jacobson), this time an authentic Orthodox rabbi—Judah (Yehuda) Leib Levin (1863-1926) from Detroit, Michigan. Judah Levin was a Russian Jew, who settled in USA in 1894 and served as a rabbi until his death in 1926. Levin was an inventor by avocation and he secured three patents for calculating machines (US706000 from 1902, US727392 from 1903 and US815542 from 1906). A model of the third machine (from 1906) was placed on permanent exhibit at the Smithsonian Institute since 1938 (see the lower image). It is a steel (for the frame), plastic and paper (for keys), leather and velvet (for the suitcase) made device, with overall measurements: 25 cm x 39.5 cm x 15.4 cm. The ten digit keys are arranged in two columns (on the patent drawing they are arranged in one column) on the left side of the device. 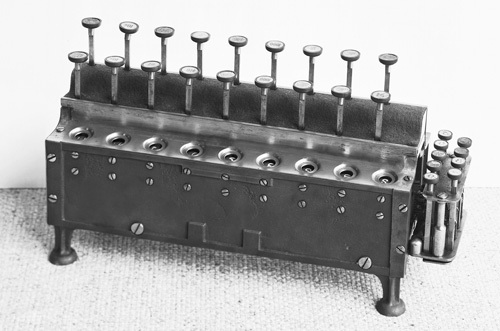 Two rows of nine operating keys across the top indicate the place number of the digit entered. The front row is for addition and the other is for subtraction operations. To enter a number, both the digit key and the place key should be depressed. By providing two sets of keys, one for determining the digits and the other for determining the value of each digit or its place in the number and also to operate the mechanism, the speed of operation is greatly increased and liability of mistakes lessened, as the keys are operated in the same order in which the person would call or write the number. Thus writing or speaking "4000" the digit "4" is expressed first and the its value or place in the number. Numbers through 9999999 can be indicated. The metal keys have plastic and paper key tops. The space under the keyboard is covered with green velvet. The result is indicated on a row of red number wheels below these two rows of keys. The machine is stored in a small black suitcase covered with leather, lined with cloth, and provided with a metal handle on top. Who was the inventor Judah Levin? Yehuda Leib Levin (son of Nachum Pinchas) was born on 26 March, 1863, in Traby, Vilna Province, Russian Empire (now small town in Belarus (Трабы, Ивьевский район, Гродненская область)). Levin's father died when he was eight years old, and his uncle rabbi Abraham Abramowitz, an esteemed Talmud scholar, assumed the responsibility of raising him. When Levin was 19, he went to study Talmud in Volozhin and Kovno and received rabbinical ordination. Shortly after his marriage to the daughter of a rabbi—Esther Rhoda Trauber-Levin (1863-1933), Judah Levin, at age 24, became rabbi at Liškiava, Suwalki Province, now village in Lithuania. The family had 4 sons: Nathan, Samuel (1888-1975), Isadore, and Abraham. In 1892 Levin immigrated to America where he accepted a rabbinical position in Rochester, New York. Two years later, he returned to Russia to become rabbi in Kreva (now in Belarus). Within a year, Levin returned back to US serving as rabbi in New Haven, Connecticut. In 1897 he was invited by three Orthodox synagogues of Detroit to serve as their rabbi and he remained there for the rest of his life and he helped support the needs of the Jewish community during a period when it was experiencing tremendous growth. Levin was an ardent supporter of religious Zionism. Though not a prolific writer, he published two volumes of sermons and commentary. Judah Levin died in Detroit on 27 March, 1926, at the age of 63, leaving many unpublished manuscripts.